Today, Ameripack announced their newest case size, the AP2624-0803WH Rotomold case. This case is rotationally molded to provide a lightweight, rugged housing for your delicate instrumentation. Available with or without edge casters and a retractable handle molded into the case, your usable internal size is 26.00” X 24.00” X 11.00”. 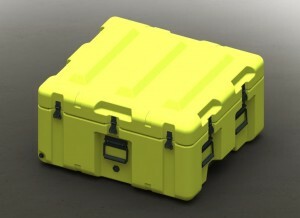 Available in your preference of colors, hardware, and custom integration by Ameripack this case is sure to please.